Hello and welcome to 2015! I am slightly surprised and a little bit bewildered that 2014 is over already. I feel a bit like I blinked and missed it. Oh well, here we are in another year and it's a new beginning! Let's start it off in the right way with this (hopefully) brilliant reading challenge. I'm so glad that so many of you have decided to either stick with the challenge or that you've been really brave and made a start of something entirely new and different. Old or new, I am hugely appreciative that you're doing this challenge with me. We'll have fun, I promise. This is my first time running a reading challenge and my first organising monthly giveaways, so please bear with me. I'm doing the best I can and luckily for me (and for you!) I've been in touch with some lovely people at different UK publishing houses. Which means that you will be receiving some incredible books in the next 12 months. I also hope to sponsor some international prizes as well AND (if it's something many participants want?) some non-book prizes as well? Let's see. If you are a publisher or author who would like to sponsor a monthly prize pack, please do get in touch with me via email. Thank you. January's prize pack has been kindly donated by Random House! 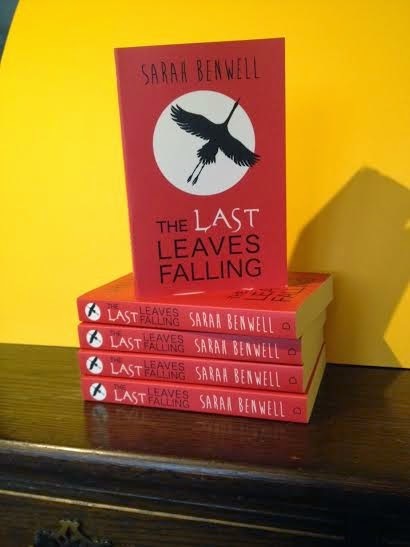 I'm very excited to be giving away 5 copies of the amazing The Last Leaves Falling by Sarah Benwell. Which means that for January, there will be *five* winners and because I'm posting the books myself, this will be available to international participants as well! One winner will be picked at random from the list of valid reviews submitted each month and will be announced in the following month's review link up post. The winner(s) will then have 1 week to contact me to claim their prize or a new winner(s) will be chosen. Obviously the more reviews you enter the greater your chance of winning but it doesn't matter if you only review one book (or even skip a month or two in the challenge!) you'll still be entered for each review you do write. The Last Leaves Falling is seriously amazing! You should read it straight away :) Good luck to you this year! First one for my January reads is up :) And now on to reading the sequel! Glad you like it :) Definitely one of my favourite trilogies! I just linked up with The Silkworm but forgot to add the title :-( If you would like to add it after Novel Meals that would great! Can't wait to learn about all these titles I've never heard of! Thank you! I've done two in the last two days. I'm doing excellent reading! If I want to share my review, but not be part of the giveaway since I'm not from the UK, should I just leave a link here for people to check out if they'd like? Excellent, thanks :) I'm pretty excited too. Anyone else love Maisie Dobbs? Hi Michelle! Quick question, does Sarah Crossan count as a British book author? She's on many UKYA lists but she's Irish and she lives in New York (according to Goodreads) :) Thanks. YES! She counts. Goodreads is out of date :) She did live there for a few years but now she lives near London and totally counts. First review so far: Winnie-the-Pooh!